Detail of notes taken by President John F. Kennedy during a meeting of his security council on Oct. 25, 1962. Note the word "missile" written repeatedly in the upper right corner. The black-and-white image is as familiar as it is iconic. The Oval Office photograph captures the solitude and solemnity of the U.S. presidency and the overwhelming sense that the young John F. Kennedy carried the weight of the nation on his ailing back. The picture, taken from behind, shows Kennedy with his head bent and his hands outstretched on his desk. It actually was taken in February 1961, only a month after he took office, yet it would come to symbolize the pressures of the Cuban missile crisis that unfolded more than a year later. 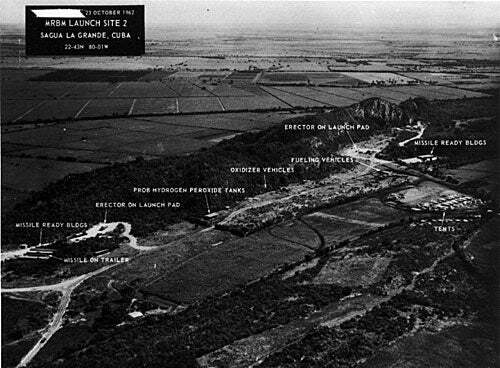 The 13-day standoff in October 1962 between the United States and the Soviet Union, which had installed nuclear weapons in Cuba, is when analysts say the world came closest to nuclear Armageddon. The photo, christened “The Loneliest Job” by The New York Times, whose photographer George Tames snapped it, is part of a new website at the Harvard Kennedy School (HKS) marking the 50th anniversary of the crisis. The site is devoted to providing background on the conflict and encouraging reflection on the lessons learned from an event that eventually was viewed as a deft dance of diplomacy and an enduring teaching tool for current and future leaders. The site draws from the Belfer Center’s trove of material about the crisis and from other sources. It includes a historical timeline, archival photos, original documents, video clips, an assessment of present nuclear fears, and teaching tools for educators, such as a lesson plan with guiding questions, worksheets and simulations. It also includes lessons learned by key players involved in the incident. Visitors to the site are invited to offer their own lessons gleaned from the dangerous stalemate. In collaboration with Foreign Policy magazine, the Belfer Center is sponsoring an essay contest for students in grades six to 12, for the public, and for international-affairs scholars and practitioners. “We are very interested as a center and as a School in what lessons you can learn from history that you might apply to help deal with current problems; I think the Cuban missile crisis is an excellent illustration of that,” said Graham Allison, director of the Belfer Center for Science and International Affairs. 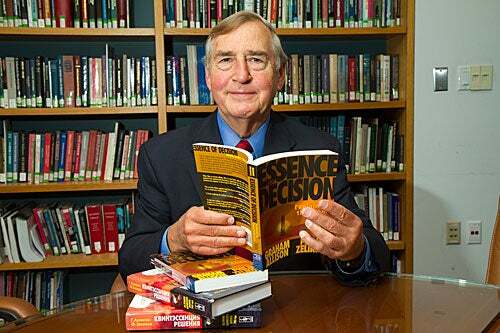 His 1971 treatise “Essence of Decision: Explaining the Cuban Missile Crisis” is widely credited with transforming the field of international relations. (Based on the release of new material about the crisis, he rewrote the book in 1999 with author Philip Zelikow.) The work explores the nature of the crisis from three decision-making perspectives: the rational actor, governmental politics, and organizational behavior. During an interview in his Harvard office, Allison offered his take on the lessons from the crisis. The first is that nuclear annihilation is possible. In the aftermath of World War II, tensions escalated between the United States and the Soviet Union. As worries and distrust mounted between the two superpowers, so did nuclear arsenals, bomb shelters, and public service announcements that trained countless schoolchildren to take refuge under their desks in a nuclear attack. The crisis in Cuba looked like a struck match. Of course, the world still has nuclear-armed states to contend with, including the worrying case of Iran, a country many fear is well on its way to developing nuclear weapons. Allison has called the situation in Iran “a Cuban missile crisis in slow motion.” Iran’s leaders insist its interest in nuclear technology is purely to generate energy, but critics point to Iran’s use of deep underground centrifuges used in the production of nuclear fuel as evidence that the country is ramping up its ability to enrich uranium and develop a nuclear weapon. According to Allison, Kennedy wouldn’t rest until he had the best choice available. Kennedy’s advisers offered him an either-or scenario, to attack Cuba or acquiesce. But Kennedy refused both, judging each option “as bad as the other.” Instead, he “concocted a very imaginative but strange combination,” said Allison, consisting of a public deal (remove your weapons, and we will not invade Cuba), a private ultimatum (you must respond within 24 hours, or we will conduct action ourselves), and a secret sweetener (if the missiles in Cuba were withdrawn, within six months the United States would remove its missiles from Turkey, near the Soviet border). Like Kennedy 50 years earlier, Obama took the third option — the one that only emerged after he insisted on finding another way.